“Our survey says…” is one of the most famous quotes in UK television game show history, spouted by the hosts of Family Fortunes and now is your chance to stand under the bright lights of the studio as a contestant where big wins are up for grabs in the Double Money and Big Money bonus features! The Family Fortunes slot machine from Fremantle has a standard setup with 5 reels and 20 adjustable paylines, and you can stake a fortune each and every spin if you like as you can spin the reels from 20p up to £400 – just make sure your slots bankroll can handle the swings first though. With a bright and colourful design, original sounds from the game show included, a feature offering ‘unlimited’ free spins, and another that sees you take on the Big Money game and answer five questions to win cash - a fortune is certainly on the horizon! 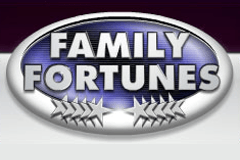 If you’re unfamiliar with Family Fortunes (although highly doubtful due to its popularity) it is a long running ITV game show that dates back to 1980 when it first aired, and has since saw 22 series produced with 545 episodes. It saw two families face off against each other answering questions which were surveyed to 100 members of the public and when the host revealed the answer on the large electronic board (which was originally known as Mr. Babbage) they stated ‘the survey says…’ before it was revealed. A correct answer was greeted with a ‘ding’ while an incorrect answer brought the unwelcome ‘Eh-uhh’ sound with a large X marked on the board signalling the loss of a life. The late, greats Bob Monkhouse and Max Bygraves were hosts before Les Dennis took up the mantle as the longest serving presenter, with Andy Collins filling his shoes. The classic game show has since been revitalised with Vernon Kay taking the hot spot under the new title of All Star Family Fortunes with celebrities and their families taking the role as contestants for charity. I must admit, I was bitterly disappointed with the range of symbols in Family Fortunes as they are so simplistic like those in the Blockbuster slot machine. The game show offers ample opportunity for a wide range of symbols such as a silhouette of a host, contestant, the famous electronic board, the stage where the two families face off – heck even an X that represents incorrect answers would have been appropriate, but none of those feature. Instead, the twelve symbols that you’ll encounter include a simple Wild with stars surrounding it which can substitute for all but the two special symbols, which are the Double Money and Big Money symbols – both of which simply state their words respectively. There is also the iconic Family Fortunes logo, a question mark, four different coloured stars, and also the low-paying Ace to Jack playing card symbols that we are so accustomed to seeing. Double Money could be quite the understatement as this bonus feature offers the potential for absolutely huge wins. Beginning once you land a Double Money Scatter symbol on the third, fourth and fifth reel during the same spin, it triggers a free spins mode. However, unlike most that see you granted ten free spins Family Fortunes awards you with ‘unlimited’ free spins – ending only once you strike three of the red crosses which appear underneath the reels. This bonus features begins once you land three or more of the Big Money symbols in view on one spin and sees you join the host on stage in front of the large electronic screen for the famous Big Money mode where big wins can be enjoyed. Just as happened on the actual television game show, it sees you faced with five multiple choice questions and having to discover the most popular answer by those who were surveyed. For each correct answer you will be awarded a cash prize, while the top answer results in even greater wins. The Family Fortunes slot machine has proved to be very popular at UK online casinos and while it is disappointing that the symbols are so simplistic, the fact that there is an ‘unlimited’ free spins mode is fantastic (it always seems to bring big wins), and I especially loved the Big Money bonus game which is based on the show and sees you take the roll of a contestant to answer questions for even bigger cash rewards. The survey says… get spinning the reels now!